Coming back to school this year was particularly exciting as we were preseason ranked number one. On our first team trip we were all ready to prove we deserved our number one ranking. Before our first tournament however, we were offered a golfing trip of a lifetime. We traveled to the east coast where we would play 5 courses, all ranked within the top 30 of Golfweek’s best courses list. We played the number one ranked course, Pine Valley as well as: Shinnecock, Sebonack, Friar’s Head, and National. It was a blast as all courses were great in there own way. 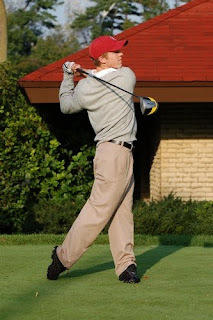 Then we headed to Chicago where we would play our first tournament at Olympia Fields CC, the site of the 2003 U.S. Open. The course was one of the toughest I have played and we finished fourth. As we returned from our trip we were immediately shoved back into reality, as classes would begin the next day. Since then our new team has had some time to get to know each other. In my three years on the farm, I have noticed that the team dynamic is different every year. With three new freshmen coming in this year, it is hard to know beforehand how the new team will mesh. Fortunately our team has grown close through the fall as we all are united under common goals. We would go on to finish second as the Prestige at PGA West and third at Isleworth in Florida. With one tournament left, we were hungry for a win at Cordevalle, especially since we had lost our number one ranking. With a great final two days of play we were able to pull out the victory to beat the current number one ranked team, Oklahoma State. As the fall season has ended and we look towards the beginning of our spring season, I am filled with excitement. This year especially, I feel like we are on the right path. While we go back home for Christmas break and a few weeks of “off” time, you can rest assured that we will be working harder than ever on our games to be ready come tournament time. 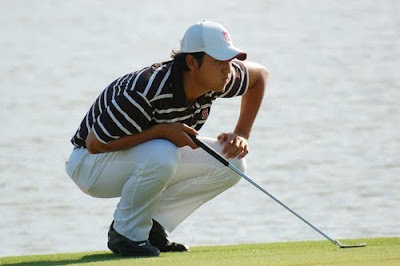 Photo of Sihwan at Isleworth CC courtesy of Stanford photo. 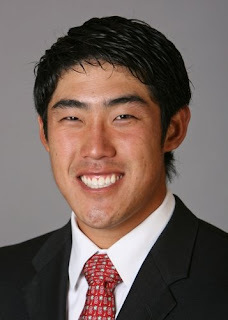 Editor's Note: Stanford's All-American junior Sihwan Kim writes about the fall season. Sihwan has had an excellent fall season as he has finished 2nd, tied for 8th, tied for 28th and tied for 2nd in his 4 tournaments. 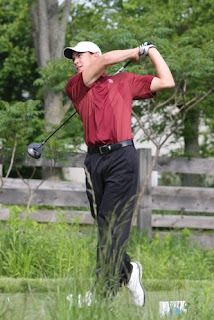 He leads the team with a 71.2 scoring average. Sihwan was also just named the Pac-10 player of the month for November. 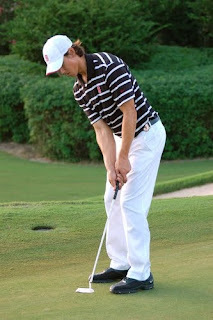 After a long summer, I was excited to play college golf once again because I knew that our team was as strong as ever. 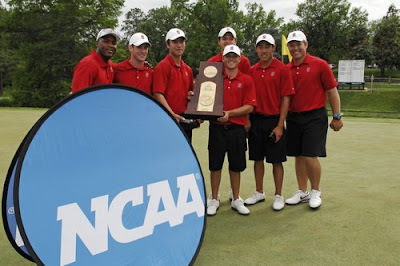 I knew that if we just play decent golf, we can win every single golf tournaments and ultimately NCAA. We started this year with some good practice and memories. We got to play 5 great courses including Pine Valley and Shinnecock Hills. I’ve never played so many good courses in such a short period of time. Then, we headed off to Chicago for our season opener. This fall season was the best fall season out of three years I’ve been here and I hope that it will get better. We finished 4th, 2nd, 3rd, and first place at Olympia Fields, PGA West, Isleworth, and CordeValle respectively. It felt really good to finish the fall season with the win. And as for the spring, I hope Joe comes back and helps us out to win the NCAA. My senior year has finally come and I can’t believe how fast time is flying. I remember looking back to high school and thinking how many more years until I graduate. It seemed like time moved so slowly. Now, I am almost done with my fall quarter already, and I feel like time is moving so quickly that it is hard to keep up. I have always been told that college would be done before I knew it, and still to my surprise, it is almost over. The highlight of the year thus far was getting to spend a morning with Tiger Woods on Monday during President’s Cup week. It was 7am and the team was about to have another productive morning practice session. The coaches were a little late that morning and the team knew that something had to be going on. We thought that maybe they were playing a prank on us or watching from a distance to see what our reactions were. Sure enough, Coach Ray came flying towards us from the far end of the new practice facility with someone sitting next to him in the golf cart. To the teams’ surprise, it was the number one golfer in the world and perhaps one of the best (if not the best) athletes of all time. An experience like this would only be possible at Stanford. Tiger had a chipping contest with us and played a few holes on the facility with us. As serious golfers, getting to spend a morning with Tiger Woods is without question like a dream come true. Furthermore, this is a memory that I will remember for the rest of my life. The team this year is quite possibly the deepest team I have played on in my years at Stanford thus far. I am very excited for the chance to compete for the national championship this year, because I promise you there is no team in the country that is more ready to take home the national championship! We are working hard, and I feel like everyone on the team is on the same page with regards to what is will take to achieve our team goals. Please be watching out for us come spring season! Recently graduated Dodge Kemmer was named an All-American Scholar for the 2008-09 season. A press release is included below indicating the criteria for selection. A complete list of All-American Scholars for 2008-09 can be found here. | A complete list of all Stanford All-American Scholars and All-Americans can be found here. NORMAN, Okla. – Cleveland Golf/Srixon All-America Scholars for Divisions I, II and the NAIA have been announced by the GCAA. A total of 108 players in Division I, 37 in Division II and 11 in NAIA earned the honor. Additionally, 17 honorees were added to the previously released Division III Cleveland Golf/Srixon All-America Scholars. To be eligible for Cleveland Golf/Srixon All-America Scholar status an individual must be a junior or senior academically, compete in at least two full years at the collegiate level, participate in 70-percent of his team’s competitive rounds or compete in the NCAA Championships, have a stroke-average under 76.0 in Division I, 78.0 in Division II and NAIA and 79.0 in Division III, and maintain a minimum cumulative grade-point average of 3.2 in Division I, II and III and 3.5 in NAIA. A recipient must also be of high moral character and be in good standing at his college or university. 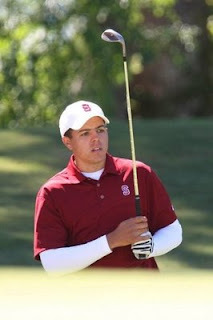 In addition to the great win by David Chung in the prestigious North-South Amateur Championship held at Pinehurst #2, All-American Steve Ziegler advanced to the round of 16 at the British Amateur held June 15-20. Steve now is the 19th ranked amateur in the world. In other action, recently graduated Dodge Kemmer and incoming freshman Steven Kearney competed in the Sahalee Players Championship. Dodge finished tied for 12th and Steven finished 55th. Meanwhile, after a great start to the summer by Sihwan Kim, he continued his fine play finishing 24th in the Dogwood Invitational. Results can be found below for the four events.